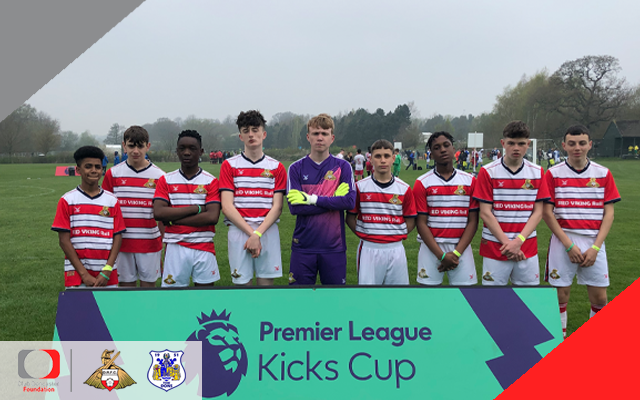 Club Doncaster Foundation took a team of Kicks participants to the University of Warwick for the Premier League Kicks Cup on Monday April 8. The players, who represented Doncaster Rovers, took part in an under 16’s 6-a-side tournament, facing off against some of the best teams in the UK. The latest edition of the competition had more than 700 young people representing 65 professional football clubs coming together to play football and form friendships. As Premier League Kicks’ main tournament throughout the footballing calendar, teams from across the UK featured, including Manchester United, Liverpool, Newcastle and many more. The Doncaster Kicks side faced off against Hull City, Crystal Palace, Blackburn Rovers, Manchester United and Stoke City, securing victory over Hull and pushing Premier League side Crystal Palace all the way in an entertaining draw. Palace went on to contest the final, losing out narrowly to Watford. As well as the action on the pitch, there were plenty of other activities for the young people to take part in. Freestyle world champion Liv Cooke was on hand to show the skills that led to her claiming the Freestyle Football World title and encouraged other players to join in. Sport development officer at the Foundation, Mark Cooper, commented: “The entire event was a great experience for our team. They really enjoyed it and had the chance to test themselves against some really good Premier League sides. It began in 2006 and is now run by 69 professional football clubs. Kicks aims to inspire children and young people to develop their potential, enhance their wellbeing and positively impact their communities to be safer, stronger and more inclusive.